I found myself sitting in a small, underground room, illuminated by fluorescent bulbs. The air reeked of an old-fashioned smell, probably piped throughout the building. This scent, along with the hot pink doors on the toilets next door, took me to an earlier era - but not early enough. The presenter began his introduction to Organic Intelligence, a leading-edge, body-based therapy for shock trauma. He shuffled through slides as he ambled across the front of the room, explaining how the human nervous system was designed for the reality of the hunter-gatherer period, not for our speedy, complex, and uncertain modern world. Thus, nervous system dysregulation can impact almost everyone in these busy times, not just those subject to the distress of trauma. When your nervous system is regulated, you’re able to respond to perceived danger in an appropriate manner and then return to a baseline of calm. These days, perceived danger can be anything from a nasty comment to fear for your job. More and more people find themselves constantly stressed with little recourse for turning down the frazzle. Do you have a hard time relaxing? Do you often feel on edge? Do you frequently feel restless? Do you feel uncomfortable with unscheduled time and open space? Do you have trouble returning to a calm baseline after an upsetting or frightening occurrence? During the hunter-gatherer period, people lived in small tribes surrounded by nature. They enjoyed regular social engagement through forms like storytelling, singing, dancing, and ceremonies. They followed the rhythms of nature, rising with the sunrise and resting with sunset. Even though they faced danger at times, these social and environmental factors supported nervous system regulation. Now, those natural factors elude many of us. At the break, I wandered upstairs and outdoors, where I could breath freely on this sultry, cloud-covered night. Tears tricked from the edges of my eyes. For a few moments, I spontaneously grieved for the loss of these earlier times when connection with others and with the natural world mattered and, in fact, came first. Recently, a health care provider suggested I spend less time on electronics due to radiation issues. This didn’t surprise. It feels like a cellular memory of these earlier, non-electronic times had already been calling me away. But, in response, I feel an inner conflict. My online activity constitutes my self-created identity, plus I value my connections on the web. The thought of “dropping out” also means facing the unknown, the uncertain, the void. A bit scary, but then they say you should do something scary everyday. My friend Robin Easton, author of Naked in Eden, went cold-turkey off the internet for a long while. She spends a good part of her time in the wilderness, mostly being rather than doing. She's back online, but not so often. I find each one of her social media updates deep, nourishing, and positively challenging. But I'm happy she enjoys the solitude she needs. I sometimes wonder, "Would this be the right way for me?" We each have to find our own way, don’t we? I value the care and wisdom that can be conveyed through words. So much so that I’ve built my world around sharing my words via electronic communication, hoping they will soothe, strengthen, and support others. I’m not ready for a sudden departure from the inter-webs. So I continue to strive for the middle way, determined to make time for the natural simplicity and peace of mind my heart desires. Writing the draft of this piece by longhand, instead of on the computer. Turning the Wi-Fi off at night. Sleeping more and resting when I feel tired. Taking a day of rest. Engaging in activities that slow down the pace like Tai Chi. It could be baking bread, gardening, knitting, or something else that's a good fit for you. If you’re longing for peace, I understand. It sometimes seems like an unattainable commodity in this chaotic world, in which addiction to stimulation, instant feedback, and constant interaction have become the norm. But, serenity awaits you if you choose it. The secret is to take intentional steps that integrate peace into your daily life. And big whopping dose of nature can also set your system straight. Depending on your personal situation, cold turkey could be the answer for you. 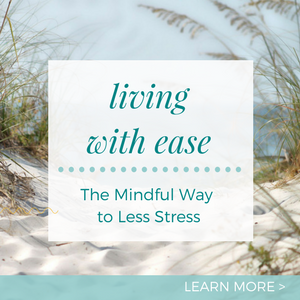 My e-course, Living with Ease, The Mindful Way to Less Stress, offers a complete roadmap for dissolving stress and preventing it from overwhelming you again. The course combines mindfulness, self-inquiry, and supportive stress reduction techniques to help you give stress the boot. Check out the course details here. Apr 9 Can Illness Be a Path of Self-Transformation?